Wash the greens, drain and wash again. Drain and cut away any heavy stems, seperate from leaves. Cut leaves into bite sized peices. and set aside. 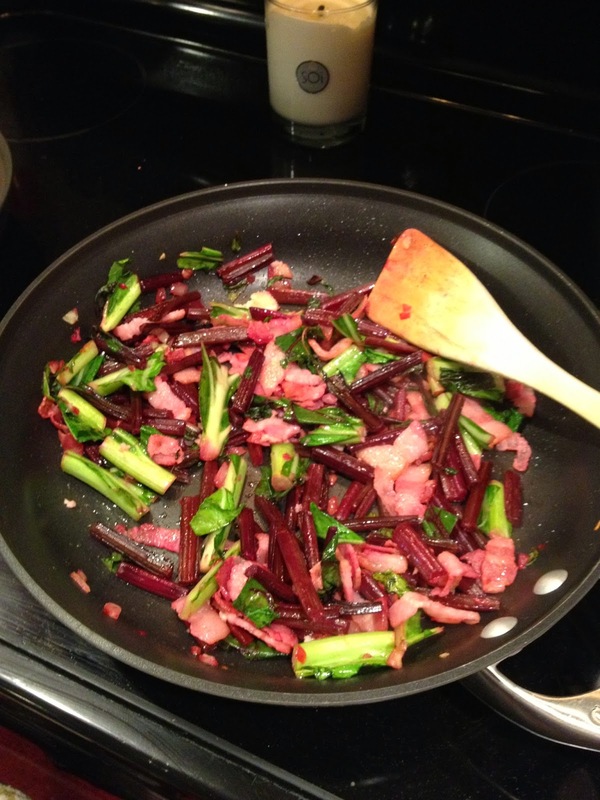 In a large skillet or 3-qt saucepan, cook bacon until lightly browned on medium heat. Add onions and heavy stems. Cook on medium heat for 5-7 minutes, stirring occasionally, until softened and onions start to brown. Stir in garlic. Add water to the hot pan, stirring to loosen any particles from bottom of pan. Stir in sugar. Bring mixture to a boil. Add the Kale or Collard greens few minutes before adding the beet greens, gently toss in the onion mixture so the greens are well coated. Reduce heat to low, cover and simmer for 5 minutes until the greens are tender. Stir in vinegar.